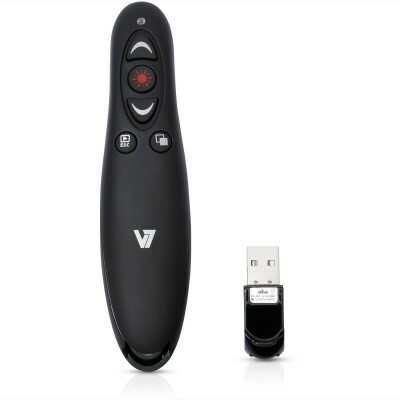 Control your next presentation with the V7 professional wireless presenter. Its ergonomic design with soft-touch finish fits comfortably in the palm of your hand and provides 5 control buttons (Page Up, Page Down, Screen Blackout, Play/Exit, Laser) to effortlessly navigate through your presentation. The high performance red laser pointer lets you emphasize key points to your audience. Use the Micro SD card reader that is integrated in self-storing USB Nano receiver to upload presentations on the fly.